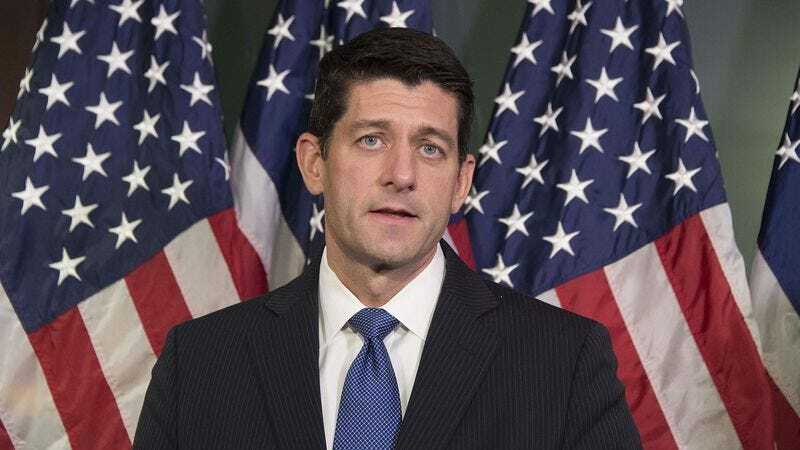 WASHINGTON—Saying he will be shocked and saddened by the statements of his party’s presidential nominee, Speaker of the House Paul Ryan told reporters Thursday the comments Donald Trump will make over the next several months are “highly regrettable.” “I want to make clear that the remarks Donald Trump will say in the weeks ahead are unfortunate and do not reflect the views of the Republican Party,” said Ryan, who noted that while he did not agree with the “harmful and divisive” language Trump would choose to use between now and the election, he believed he could work with the candidate to enact a strong conservative platform. “Mr. Trump will take some distressing and morally indefensible positions during the remainder of his candidacy and, if the election goes as we hope, his presidency. I trust that we can move on from these regrettable lapses in judgment that will continue on a regular basis and get back to the issues that matter.” Addressing recent inflammatory comments made by the GOP nominee, Ryan added that he just had a productive conversation identical to the dozens more he will have over the next three months with Trump.